Showing up on Google’s results pages is not a given. Persuading a search engine to direct traffic your way demands a certain amount of insight. On the one hand, search engine optimisation (SEO) is technical, inherently complex and in a state of perpetual flux, which makes mastering it the preserve of a small few. But on the other, much of what Google is aspiring to do with its formidable arsenal of algorithms is provide relevant, reliable results. And this is good news for those operating with limited resources. As Google gets better at rewarding quality content and genuine links, the first steps to optimising your website and improving search engine rankings are in many ways becoming simpler. Here are the basics. Some people will search for you by name, but such navigational searches will account for only a small part of the queries directing users to your site. To attract traffic your website needs to let search engine crawlers know you can meet specific demands. You need to know the words people are using when they search for the services you offer. To work this out you can turn to Google’s Adwords Keyword Planner. By feeding in key terms relating to your organisation’s focus the planner will give you the search volumes associated with those terms as well as suggest related and alternative keywords. Once you’ve determined which keywords are most likely to usher visitors to your site, use this vocabulary strategically. A lot of the keywords will work their way into your content organically, but it’s worth making a few further tweaks. Start with the basics. Ensure the name of your website (title tag) and the short description below it (meta data) contain your strongest keywords. You can similarly tweak the title tags and meta data of all your inner pages. Your first instinct may be to have your slogan in your title tag, but if it’s not commonly searched for, you’d be much better off using a relevant keyword with higher search volumes. Also include keywords in the headings on your site. Much like we do when we read, headings are some of the first things search engines look at when determining the relevance of a page to a search query. Search engines rely on the descriptions (alt tags) assigned to photos and video clips to know what they relate to. So rather than uploading your new company video with the name “newpromovid.avi”, refer to your keywords and change it to something descriptive and relevant, like: “How we are helping endangered animals”. Work in one industry long enough and you’ll inevitably succumb to speaking in acronyms. Whilst this is a great shorthand for office communication, online it could have you losing out on using powerful keywords. Consider which is more likely to attract a relevant search query: “the latest from the BRAT” or “the latest from the Black Rhino Anti-Poaching Team”? Google can tell whether a site loads quickly, is free from coding errors and features frequently updated unique content. You may need to call in the professionals to spruce up the design or clean up your code, but a large part of the argument that your site deserves a high ranking will be won with rich and valuable content. Ensure your existing pages have descriptive, keyword-rich, detailed and well-edited copy. Then get visitors to stay on your site, come back and share your content. Much like in business it’s not what you know but who you know. In web-terms this boils down to links. When a website links to yours it is considered an endorsement. If the link is from a reputable site it can dramatically improve your website’s own standing. You already stand to gain quality links with good content, particularly if you broadcast it through social media, add share buttons and provide space for comments. But you’ll probably want to compliment this with proactive link building. Get to know your online neighbourhood by reading blogs, commenting on posts, signing up to newsletters and following social media accounts. Then offer them relevant content. Optimising your website is a long-term commitment. 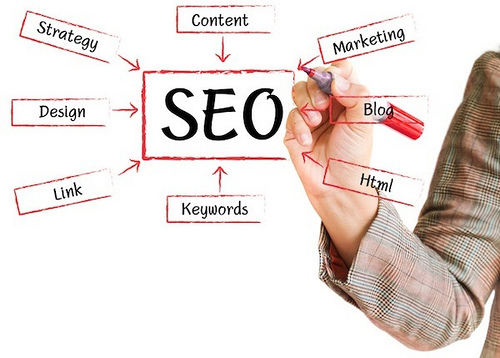 A single burst of frantic SEO activity will probably not yield the results you’re hoping for. Don’t be tempted to pander to spamming by getting links from low-quality websites or buying links either. Search engines are quick to catch on (and getting better at it). Melissa is a writer at Go Up a design, inbound marketing & SEO company in London, where she is trying to make sense of the ever-changing field of online communication. She cut her teeth on public health communication in South Africa where she trained journalists and regularly commented on press coverage of the HIV epidemic.